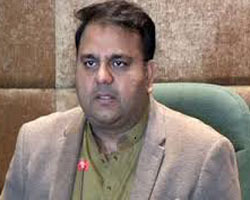 ISLAMABAD, Jan 19 (APP):Federal Minister for Information and Broadcasting Chaudhry Fawad Hussain Saturday expressed deep grief and sorrow over the sad demise of renowned television artist Gulab Chandio. The minister, in his condolence message, said the memorable characters performed by Gulab Chandio and his dialogues in several teleplays were still imprinted on the minds of viewers. Fawad said Gulab Chandio was a great actor and the vacuum created by his death would be felt for a long time. He prayed to Almighty Allah to rest the departed soul in eternal peace and grant courage to the bereaved family to bear the loss with fortitude.